Vryhof Anchors, a Vryhof company, has announced a number of contracts for its STEVSHARK®REX anchoring solution with Anglo-French independent operator Perenco and its Congolese subsidiary Perenco Congo SA; Maersk Drilling in Trinidad; and international EPC contactor CNGS Group. In addition, two STEVSHARK®REX’s will also be deployed by Jan De Nul Group, a leading dredging, offshore, civil and environmental contractor. 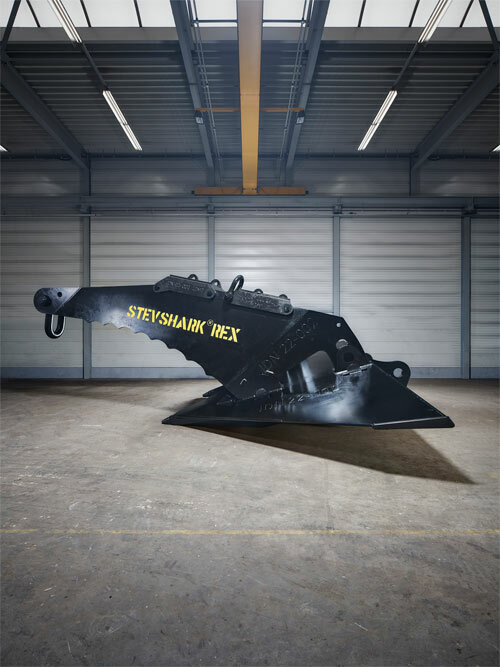 The contracts confirm the STEVSHARK®REX - with versions ranging from three to 60 metric tonnes (mT) - as the new industry standard in hard soils, with its’ radical new fluke and shank geometries ensuring widespread adoption in the oil & gas, offshore construction, dredging and marine renewables sectors. “In April 2017 when we launched the STEVSHARK®REX, we promised that it would redefine the application boundaries of drag embedment anchors, bringing more remote areas in shallower waters but with harder soils into play for offshore drilling, production, dredging and construction,” said Vryhof Anchors Managing Director, Leopoldo Bello. A contract to deliver twelve 16 mT STEVSHARK®REX anchors to Perenco Congo SA to support permanent moored assets for the La Noumbi FPSO in the Yombo Field, offshore Congo. The field is characterised by irregular seabed, due to hard outcropping sediments and pockmarks - remnants of dewatering and/or degasification processes. The delivery of STEVSHARK®REX anchors to Maersk Drilling offshore Trinidad and the ‘Maersk Developer’ semisubmersible, where the anchor has a holding power of 47% more than previous anchors used in the area - block E of the East Coast Marine Area (ECMA). A contract with Luxembourg-based Jan De Nul Group to supply two customised 26 mT STEVSHARK®REX anchors and a 29.2 mT external ballast to support the Willem van Rubroeck cutter suction dredger (CSD), the world’s most powerful cutter dredger with total installed power of 40 975 kW and dredging capabilities of up to 45 metres depth. Whereas previously, heavy concrete anchors were used to control the cutter head, the Jan De Nul Group will now enjoy the lighter, improved performance of the STEVSHARK®REX as well as specifically designed cutter points, thereby opening up new opportunities in hard soil areas. The STEVSHARK®REX has also undergone extensive testing in cooperation with Australian operator Woodside Energy at four different locations on the Angel oilfield in the North West Shelf of Australia. In fields selected due to the presence of calcarenite - a cemented and brittle rock - all four tests were faultless with the anchor able to keep the 243 mT bollard pull anchors handling tug supply (AHTS) vessel in position during proof load tests.